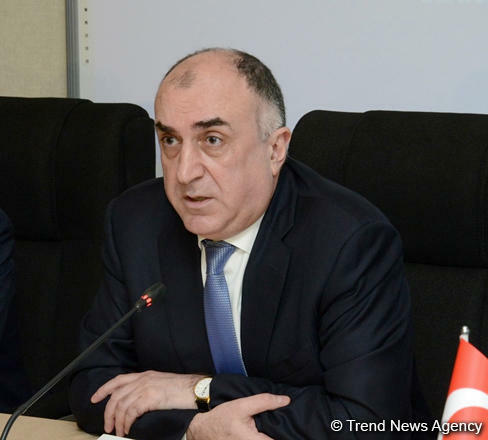 Trend News Agency interviewed Azerbaijani Foreign Minister Elmar Mammadyarov. - A conference of Palestinian ambassadors in Asian countries has been recently held in Baku. In his speech, Palestinian Foreign Minister Riyad al-Maliki, who participated in the event, highlighted Azerbaijan’s support for Palestine. What is Azerbaijan’s position on the Palestinian issue? - Positively assessing the appeal of the Palestinian side, Azerbaijan decided to hold this conference. The conference was held in Baku on November 5 and gathered Palestinian ambassadors in 27 Asian countries. I would like to emphasize that until today, many international events on Palestine, involving and organized by the UN institutions, the Organization of Islamic Cooperation and other international organizations, have been held in the country. As for Azerbaijan’s position, first of all, it is the long-term support that Azerbaijan renders to the liberation struggle of the Palestinian people for peace, stability and sustainable development. Azerbaijan has always been close to the Palestinian people, has supported them during hard days. This year a decision has been made by Azerbaijan to allocate $200,000 to the United Nations Relief and Works Agency for Palestine Refugees in the Near East (UNRWA). As for the Palestinian issue, it was stressed repeatedly and at the highest level that Azerbaijan supports the settlement of the Palestinian issue on the principle of creation of two states with the capital of a Palestinian state in East Jerusalem. - What is the basis of the success of Azerbaijan’s foreign policy, which has great prestige in the Islamic world and which established fruitful cooperation with Western countries? - I would like to stress that the foreign policy being pursued under the leadership of Azerbaijani President Ilham Aliyev is based on the country’s national interests. The independent, pragmatic, balanced and flexible foreign policy of Azerbaijan, located in a complex geo-strategic region, provides an opportunity to establish mutually beneficial cooperation both with the Islamic world and Western countries. As a citizen of Azerbaijan, you know well that Azerbaijan is a country where various peoples and representatives of various religions live peacefully and safely for centuries, and these traditions have become an integral part of the country’s policy. Along with the fact that Azerbaijan is a country committed to its national and religious traditions, it is open to the world and the ideas of multiculturalism. Multiculturalism is even the state policy of the country. The establishment of friendly relations and cooperation with all countries and a contribution to international peace and security is one of Azerbaijan’s foreign policy priorities. Azerbaijan has established cooperation and mutually beneficial partnership with all countries, except Armenia, which has occupied the territory of our country. - In foreign policy, the recent visits and the adopted declarations give grounds to say that attention is paid to the trilateral format of cooperation. Does this format have any advantages and what are they? - Meetings have been recently held in trilateral and even quadrilateral cooperation formats. Along with further development of cooperation with countries sharing common interests and goals, these formats contribute to the security in the region. Two tripartite meetings have been recently held in Istanbul. It is enough to review the Istanbul declarations adopted following the meetings to have an opinion about the significance of this format of cooperation among the participating countries, as well as the usefulness of this format for further development of the region. The matter does not rest in changing the bilateral format to a trilateral or a bigger format - each cooperation framework has its place and exceptional importance. One should take into account that the meetings of states that have mutual interests and share concerns in the current extremely complex geo-political situation and their steps aimed at ensuring peace and stability in the region only serve to development and progress. - Recently, your speech in Istanbul has been much discussed on social networks. Along with those who criticized you, there were numerous of our compatriots who defended you. May I ask, what is your attitude to this issue? - You know, those who want to understand me, succeed in this perfectly well. As for those who do not want to understand, it is their fault. - Let's return to the multilateral cooperation formats and the development of external relations. The activity of foreign diplomacy is evident against the backdrop of the recently increasing foreign visits, visits to our country, and ongoing dialogues of strategic importance. Your opinion in this regard is very interesting. - As the President of Azerbaijan noted at a meeting of the Cabinet of Ministers on the results of the socio-economic development in the nine months of this year, in 2018, the international positions of Azerbaijan strengthened even more, and today Azerbaijan is seen as a reliable partner in the world. This is undoubtedly the success of foreign policy conducted under the leadership of the head of state. In this context, I would like to emphasize the adoption of the Convention on the Legal Status of the Caspian Sea, holding a meeting of the foreign ministers of the Non-Aligned Movement in Azerbaijan - you know that next year Azerbaijan will preside over this organization and Baku will host a summit of the Non-Aligned Movement - the signing of the Partnership Priorities document with the EU and the continuation of negotiations on a new agreement, which will be a legal basis for bilateral relations between the parties, holding a meeting of foreign ministers in December this year in the framework of Azerbaijan’s chairmanship in the Organization of the Black Sea Economic Cooperation, and other significant events. In particular, I would like to emphasize the growing and unequivocal support of the international community in the settlement of the Armenia-Azerbaijan Nagorno-Karabakh conflict. The support for territorial integrity within the sovereignty and internationally recognized borders of Azerbaijan in the adopted documents and declarations serves to further strengthening the already existing broad legal framework for resolving the conflict. Of course, this speaks of the increasingly strengthening positions of Azerbaijan both in the region and at the global level. As for the activity of the Azerbaijani diplomacy, we are always focused on the effectiveness of foreign policy pursued on the basis of national interests and under the direct leadership of the head of state, and every successful result achieved, of course, pleases us. - Let's talk about the settlement of the Armenia-Azerbaijan conflict. The OSCE Minsk Group co-chairs visited the region, after which they immediately made a statement. In turn, after meeting with the co-chairs, the current Prime Minister of Armenia immediately went to Karabakh. Can we expect any changes in the conflict resolution process against the backdrop of the above-mentioned facts, and actual and concrete results in the negotiations from the new leadership of Armenia? - During the meeting with the head of the Azerbaijani state as part of the visit of the OSCE Minsk Group co-chairs to the region, an exchange of views took place on the current status and prospects of the conflict resolution process. Recently, the world community has often voiced specific messages about the consequences of the unresolved conflict for the region, in particular for Armenia, and, conversely, about the development that a solution to the conflict would bring to that country. I think that in this context Armenia's returning to constructive and fruitful negotiations would be a step taken to create the conditions for the peace that the Armenians are talking about. It is clear that, probably, the new leadership of Armenia needs time for a comprehensive study of the conflict resolution process. However, it is very important for Armenia to understand the importance of establishing relations with Azerbaijan on the basis of respect and support for territorial integrity in the framework of sovereignty and internationally recognized borders, on the basis of norms and principles of international law in order to complete the negotiation process, which has been unreasonably prolonged for decades.